Nic got his new ID bracelet and Colt is wearing two because his new one also arrived and he doesn’t want to take his old one off. He loves his bracelets. I get asked about his bracelet a lot. So, here's the reason for the Medical ID bracelet and why I recommend getting one for your little ones. Wandering, running off, or the clinical term, elopement, can be a frightening and fairly common behavior seen in children with Down syndrome. We have had some scary moments with Colt. The fact that he loves to meet others, has very little fear and can open locks, buckles, climb gates and every other safety feature, does not put our mind at ease. We are always looking for ways to keep him safe. After one scary incident we decided to order him an ID Bracelet as added protection should his propensity to wander and run off ever lead to one of our biggest fears, losing him. Now that Nic is walking we decided it was time for him to have a bracelet of his own. I am still looking into GPS trackers as well, but a Medical ID bracelet is such a simple step we can take to help our boys in a moment of crisis. 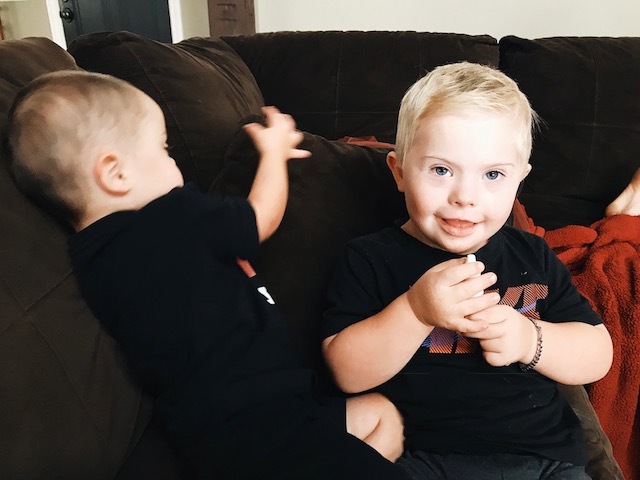 Their new bracelets are from American Medical ID who have generously offered to give 10% back on every purchase (5% on Gold) to Reece's Rainbow Down syndrome adoptions, as well as offered 10% off your purchase(5% off gold) when you enter the code “DWONDERFUL”. (Code will be valid for 2 weeks). According to "Supporting Positive Behavior in Children and Teens with Down Syndrome; The Respond but Don't React Method" by David S. Stein, children with Down syndrome do not process a lot of words in a moment of disciplining. They process strong emotions, eye contact and facial expressions and seek attention in that way. Bolting can become an attention seeking behavior. Things to do: 1) Keep your reaction in check. Run after the child to keep him safe, but do not react. Do not use a lot of words or yell or make eye contact. Remain calm. 2) As discussed earlier, ID Bracelets and GPS trackers are an important safety tool for anywhere that you are at, home and away. 3) We have discussed Colt's propensity to wander with our neighbors so that they can be aware of the situation should the boys ever get out. Nic is not a fast enough walker yet, but I am preparing for the possibility of him joining Colt too. 4) We have windows that open from the top and we do not leave them open from the bottom where the boys can reach. Why do I include this? Colt has pushed a chair to the window, popped the screen out and climbed out the window to our backyard. Fortunately, we caught him immediately, but it was a good lesson. No open windows that he can reach or even climb to reach! 5) Add chimes on doors and windows and add locks where they can't be reached. Now that Colt has grown we will be adding more locks in higher locations. We have built extra gates as well, but Colt can climb them. Hope this has given you some ideas to help keep your child safe. It is constantly a concern of mine, so please share anything that has worked for you! Have any of you had a scary moment when your child has wandered? Have you found any sort of GPS tracker or safety aids that you like? I thought our vacation plans took a turn for the worst when Colt rolled out of bed last Saturday morning with crusty, goopy eyes. Our car was packed to hit the road for a week at the beach and Pink Eye was not in the plans. As a mom to seven, I’ve unfortunately had my fair share of pink eye experience and one thing that I have learned is usually if one has it, they all will have it soon. 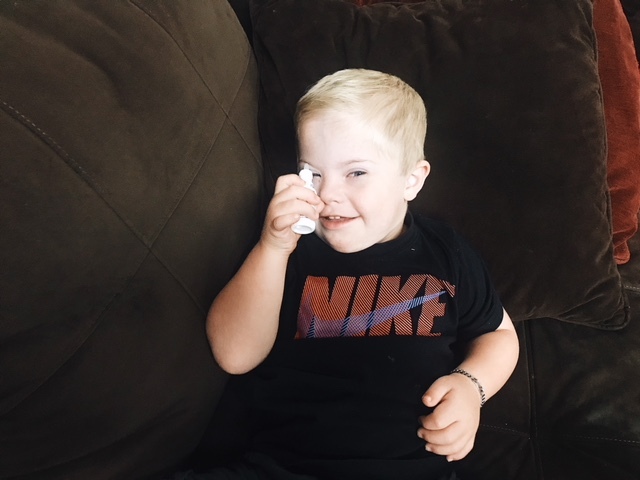 Sure enough, Nic also had the telltale signs of pink eye with eye goobers (I think that is the agreed upon, official name by mothers everywhere😊) when he woke up as well. I use Homeopathic remedies whenever possible, so I quickly ran to the store to check out the homeopathic “TRP The Relief Products™ ” that I had just learned about. I picked up TRP “PinkEye Relief ®”. The box stated that it “temporarily relieves redness, burning sensation, watering, swelling, sensation of grittiness and overnight crusting”. Most importantly, it is non-toxic with no known side effects. I immediately put drops in the boys’ eyes when I returned home. This did not prove as difficult as I was expecting, but I did need a helper so that I could gently pull their lower lid down to squeeze the drop into their eyes. We left on our trip and I continued to put drops in their eyes at morning upon waking, before and after nap time and at bed time. One week later, I can report that out of my several experiences with Pink Eye, “PinkEye Relief ®” has by far been the best remedy and relief I have found. 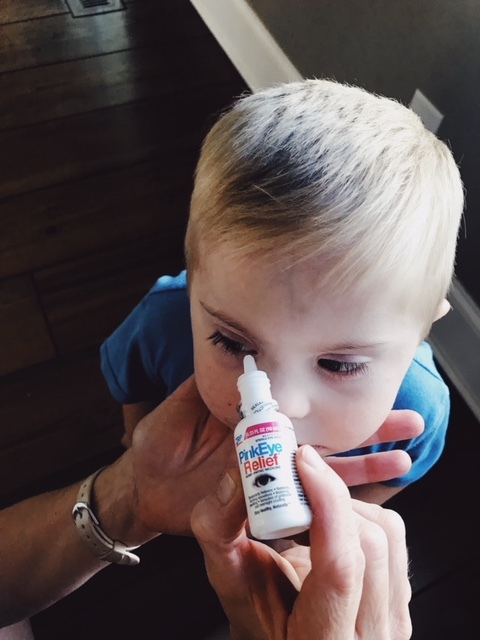 The boys’ eyes were no longer crusted over, or as I like to refer to it, glued shut with junk, when they woke up, as is the case normally for a solid week with Pink Eye. They showed minimal signs of Pink Eye because they seemingly had no irritation. This also kept them from continuously rubbing their eyes which only irritates them and aids in spreading it. 1.) WASH YOUR HANDS OVER AND OVER AND OVER. I know that one is an obvious one, but really, it is extremely contagious. I even wash my hands moving from one eye to the next. 2.) Hot compresses on the eyes are wonderful. My version of this is just washcloths soaked in warm water. Use a separate clean wash cloth on each eye every time. Seriously, this is contagious. 3.) Wash bed linens, favorite dolls and blankets and do not share or reuse towels. Have I mentioned how contagious Pink Eye is? 4.) Unless you want to be throwing out your good eye makeup, I recommend going natural around the eyes until you’re sure that YOU are in the clear. This is one mom tip that I have learned the hard way. Once your eye makeup touches your infected eye it must be trashed, or it will only spread it to the other eye and see to it that you have reoccurring Pink Eye. You don’t want that! Thankfully, no one else in the family has caught the boys' Pink Eye, which might just be a first, but don’t think I am not inspecting everyone’s eyes upon wakeup each morning. I noticed that TRP The Relief Products™ offers over 25 homeopathic remedies that are all made using 100% natural active ingredients that work safely and gently with your body. I intend to try more of them after my experience with “PinkEye Relief ®”. I found their web site www.thereliefproducts.com to be a great resource of helpful tips as well. I really hope you don’t have to use these tips anytime soon, but if you’re here, I hope you find them helpful. These are just one mom’s tips for relief and are not intended to replace your professional medical advice. If any of this helped or you have Pink Eye tips of your own, please feel free to share!